Studio Artist Paint Action Sequence (PASeq) feature called Contexts. PASeq Contexts can be recorded as individual action steps in a PASeq. 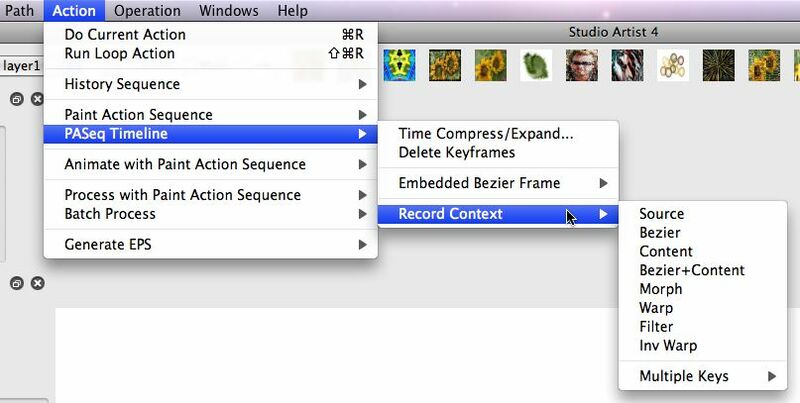 Contexts can be used to record source, content, bezier, warp, morph, and filtering keyframes within a PASeq. Contexts provide an easy to use way to replace a large amount of functionality that in previous versions of Studio Artist was implemented with multiple Layer Timeline keyframes and/or Timeline Animation operation mode functionality. The screen snap above shows how to access the menus to record all of the various Context types in a PAseq. Running the specific record Context menu will insert that Context as a new action step in the current PASeq. You don’t need to have PASeq record turned on to record Context action steps via these menus. When the Record Context menu is run to insert a new Context action step the pertinent associated state of the interface is recorded as well. For example, if you insert a Source Context then a reference to the current source image or movie is recorded within the source context action step. Source Context – records source keyframes. When recorded stores a reference to the current source. When played back will load the source with the source reference stored in the context. Content Context – records content keyframes. When recorded stores a reference to the current source. When played back will load the current layer with the image or movie frame reference stored in the context. The specified content is resized to fit the current layer if it’s not the same size. Bezier Context – records bezier keyframes. When recorded stores the current layer’s bezier path frame. When played back the current layer’s bezier path frame is replaced with the bezier paths stored in the context. Morph Context – records a source reference and a bezier keyframe. When recorded stores the current layer’s bezier path frame and the current source reference. When played back a morph is generated based on the source reference and bezier paths stored in this and the next morph context keyframe. Warp Context – records a source reference and a bezier keyframe. When recorded stores the current layer’s bezier path frame and the current source reference. When played back a warp is generated based on the source reference and the variation from the recorded bezier paths to the original bezier paths stored in keyframe 1. Inverse Warp Context – records a source reference and a bezier keyframe. When recorded stores the current layer’s bezier path frame and the current source reference. When played back a warp is generated based on the source reference and the recorded bezier paths. The source reference is warped back to match the position of the original bezier paths stored in keyframe 1. Filter Context – records a source reference and a bezier keyframe. When recorded stores the current layer’s bezier path frame and the current source reference. When played back a spatially variant filter operation is generated based on the source reference and the variation from the recorded bezier paths to the original bezier paths stored in keyframe 1. If you record a new keyframe while in Bezier operation mode, then both the bezier paths and any additional information needed for the keyframe is recorded. So a new morph keyframe would also record the current source reference. However, if you are option clicking an existing keyframe to overwrite while in Bezier operation mode then only the bezier paths will be updated, not any of the additional information stored in the keyframe. A similar situation existing when you are not in Bezier operation mode. If you are recording a new keyframe then all of the information is recorded. However, if you are option clicking an existing keyframe then the non-bezier path information only will be updated.